Fully programmable with a full spectrum of features, including Auto On/Off and adjustable temperature control. Note : Refer to the video for Installation and PDF attached below in Technical Specification for User Manual. Move aside, Keurig. The Cuisinart SS-10 Premium Single Serve Brewer is one of my favorite choices for mid-tier K-Cup brewer. Its real utility is its extreme compatibility: the SS-10 works with all K-Cup brands and comes with a reusable attachment for your own grounds. The SS-10 model is Cuisinart’s replacement for their discontinued SS-700. While the SS-10 does have some annoyances compared to the SS-700 — it splatters more, takes a little longer to brew, and is a lot lighter — I think it’s a worthy successor. Brew any K-Cup or grind your own coffee, the SS-10 does it all. You can also use the hot water button for instant coffee, tea, hot cocoa, oatmeal, or soup, and the handy “rinse” feature ensures your use doesn’t taste like the one prior. Use the control panel to set your defaults and modify from default with each cup you brew. The removable 72 oz water reservoir is enough for six 12 oz cups, and the removable drip tray can accommodate travel mugs up to 7.5″ in height. Silver with some stainless steel parts and a modern, sleek look — I’m a big fan of the SS-10’s aesthetics. At 9.5 lbs its much lighter than its SS-700 predecessor (16 lbs) but the weight loss doesn’t seem to translate to a significant loss of sturdiness. Cuisinart is one of the leaders in kitchen appliances, and I have had few issues with their products in the past. Even more reassuring is the 3-year warranty. The SS-10 unit is made of plastic with some stainless steel parts, but it doesn’t necessarily feel cheap. 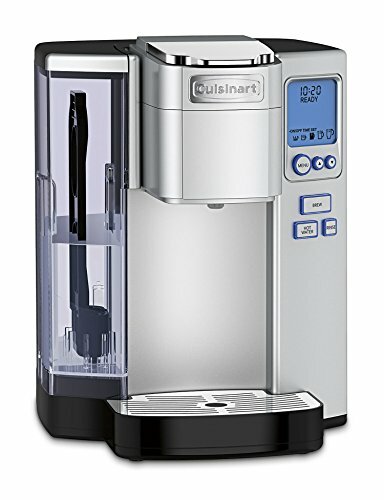 While I only used it for a few weeks without any performance issues, my supplemental research for this Cuisinart SS-10 review turned up a lot of happy owners who reported this brewer was more durable than similar Keurig units. I like my coffee strong and hot. Brewing on the “extra hot” setting, I was able to get a cup of coffee at 191°F, which is hot enough for me. Using the refillable pod I was able to get a strong 12 oz cup. A 12 oz K-Cup was pretty good, too, though not quite as strong as my freshly ground cup. All components of the Cuisinart SS-10 brewer are easily removable for cleaning. Both the K-Cup funnel and HomeBarista reusable pod are dishwasher safe. It’s recommended you wash the drip tray and water reservoir in the sink by hand. With almost all K-Cup systems, clogs happen. Like most other single-serve brewers, you can fix this by inserting a paperclip into the Exit Needle or the K-Cup piercer. There’s a “de-scale” icon on the LCD screen that notifies you of whether it’s time to clean out the inside of the machine. It’s recommended you do this every 3-6 months. You can just use equal parts vinegar and water, though the Cuisinart SS-10 user’s manual suggests two parts water to one part vinegar. It’s also recommended that you change the charcoal water filter every 2 months. From Keurig to Green Mountain to whatever you keep in stock, the Cuisinart SS-10 is compatible. I’m a sucker for the Cuisinart SS-10 reusable pod storage compartment. I don’t like using K-Cups. I’m a “grind it yourself” kind of guy, so any single-serve brewer I endorse has to be able to use a refillable pod. Super convenient bonus that impresses me more than it should: this brewer comes with a storage compartment! Like I said, I use the refillable pod for my fresh ground coffee, but I definitely don’t want to lose the K-Cup attachment in one of my messy kitchen drawers. No worries, just store it in the side compartment. Seriously, it’s stupid simple but I love it. Instead of using a needle to pierce K-Cups, this unit has a blunter, less sharp plastic piece that sometimes struggles to puncture the top of the K-Cup. Should you run into any issues, the easy fix is to pre-puncture the K-Cup pod, just like pre-drilling a screw. Single-serve brewers are great for their convenience — it doesn’t take that long to brew a single cup. However, the SS-10 is a little slower than most single-serve brewers. File this under minor annoyance, but the toggle buttons to change brew size are in reverse order! The button on the right moves your brew size selection to the left. Give it to me straight, Bryan: Cuisinart SS-10 vs Keurig. Who wins? If you’re forcing me to pick, I’ll go with the Cuisinart SS-10, but what I prefer and what you prefer may be different. Why did I choose the SS-10? What are some reasons to choose a Keurig? Have you ever used a Cuisinart premium single serve brewer like the SS-10 or SS-700? If so, comment below with your personal Cuisinart single serve coffee maker review and let us know how you liked it!